The following letters are from Jim Lyons, regarding his mothers cousin, Lyyli (or Lilli, or Lila). Jim notes that "naturally, her memory has faltered." The accounts are in the form of typewritten notes. Her name is Lilli Silven, and her aunt and uncle who were lost were William and Anna Lahtinen. They were 2nd class passengers from Finland. The thing she was most emphatic about and mentioned first when I asked for her story was that the Titanic broke in half and both ends turn up. She was quite concerned that this be known as apparently she has hears [sic] otherwise all her life. The boilers exploded with much black smoke. The people in the lifeboats were dirty from the smoke. She remembers the people swimming and screaming. Her lifeboat leaked and she was sopping wet. Spent eleven hours in boat until picked up by the Carpathia. Kids in boat hollering for food. Couldn't remember name of boat. Party on Titanic night before. People drunk from party. Clearest memory of night before was a woman (young) in a black dress who came in one door and danced alone and left again, presumable [sic] from party, which Lila didn't attend. Felt boat jerk when it hit iceberg. Just ready to go to bed. In own bed when hit (She contradicts herself) Was in bed & hit head. Jumped up and looked out window & saw ice. At first was thrilled because she thought it was snow. Heard people start yelling and getting up. Looked for uncle & aunt & couldn't find. Ran back & forth down the big hallways & it took her quite a while to find them. Uncle & aunt not excited. Christian,-nothingto [sic] worry about. Knew they "were going to go" down. Lila was running around (I guess before she found U & A) holding life preserver. A barber talked kindly (in English, which she didn't understand) to her and put her life preserver on her. Her uncle told her to get on the life boat. Lila said, " I don't want to leave you. I don't want to be left alone". Uncle said, "No. You go." He had a large cigar in his mouth. Uncle with help put Lila in boat. Uncle & aunt didn't even try for the boat. (Women & children first). Wanted to die together. Didn't want to leave each other. If ther [sic] was any hope anyone could be saved, Lila should get in boat. Had maybe one or two sailors in boat. Rowed like crazy to get away from Titanic before it sucked them under. Big waves all night. So cold. Calm in morning. People screaming worst part of boat. Didn't know where going. Ice cold & wet. People swimming and screaming. Could see U & A standing on Titanic. Still had cigar.in mouth. 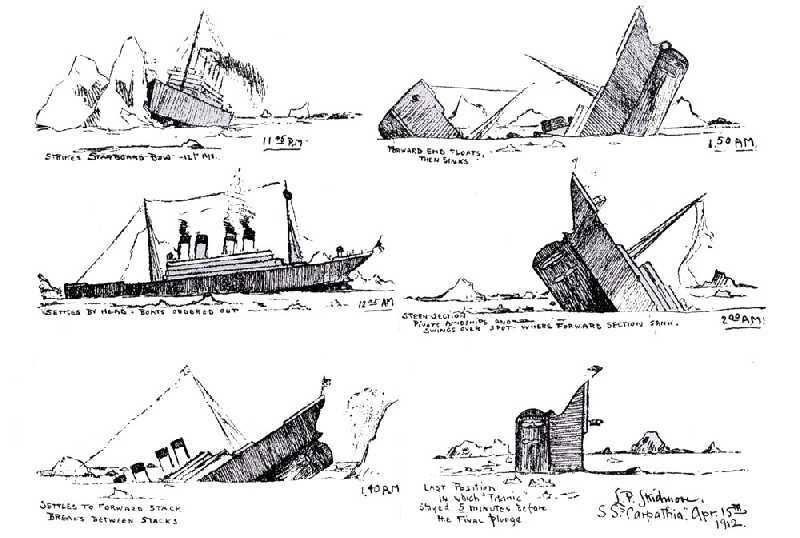 Remembers the ice on deck of Titanic & everyone scared terrible. Didn't want to get on boat but uncle told to because parents living. Felt boat jerk when hit ice. Boat stopped and started to rock. Went forward a bit & stopped again. Tilted. Uncle & sailors put in lifeboat. Lila fought to stay. Didn't know what to do. Saw uncle standing with wife & cigar. Could still see as boat sank. Astors wife only one in boat. "Rich people." she said. "Listen, 60 years ago I was there." Remember band playing "Nearer my got to thee" as boat sank. Didn't like music they played in New York when Carpathia landed. "Too sad." Played "Nearer my God to Thee" & she couldn't remember where she had heard it before. Aunt & uncle both lost - not saved. Not surprised or excited when I read her portion of your letter saying aunt was saved. Didn't believe at all-heard before that aunt was saved-waited for them to get off another boat-heard them calling in dreams. Carpathia Co. confused & told Lyyli her aunt was saved. Carpathia very good to Titanic people-gave corn soup & hot wine-sailors covered with blankets & rubbed to keep warm-4 days to NY-wore same wrinkled clothes 4 days-band played sad tunes-Red Cross asked about relatives & fed-White Star Line rented rooms for girls-bring clothes-Lyyli had cousins in Michigan. Lila knows very well aunt & uncle died-holding hands & uncle smoking a cigar-sure Titanic broken in half & both ends turned up-saw with own eyes-tried to row away from suction- lifeboat like match sticks-lots of boats sink-people yelling & screaming to be saved- Carpathia didn't come near lifeboats-one by one sailors come & take life boats to Carpathia-put kids in sack to lift to Carpathia. 1. Jim mentions that the 1953 film version of "Titanic" was being shown roughly once a year in Sacramento, where "Lili" lived. She had seen it before and "can point out the mistakes." 2. Jim notes to Lord that, "As you can see, not all she says adds up. For example, she saw aunt & uncle holding hands, but later waited for them to get off another lifeboat ( I guess she meant lifeboat). It does cast some doubt on the matter of whether her aunt was saved or lost." Many doubt the Skidmore sketch. How could the bow of the Titanic, flooded with thousands of tons of water suddenly become buoyant and float up again? To some, Skidmore must have misinterpreted Thayer's description. To others, the "floating" tip of the bow may have been the grand staircase; after all, it was pitch black and we know from Cameron's 1997 movie that the staircase could have become buoyant and floated out of the hull, where the structure could have become confused with the bow. Could've, could've, could've. Was Lylli mistaken about seeing the bow come up again? Some of her account seems confused and contradictory. Had her memory been coloured by seeing Skidmore's sketch in the newspapers at some point? Or was she and Thayer correct? A fragment of an interview with Lylli was recently posted by the Titanic International Society, sourced from an unidentified newspaper. The paper said, "'The big ship finally broke in halves - just like that.' Miss Silven made a motion as though breaking a stick in half. 'Finally the bow end went down, then the steerage end. For a time the stern of the vessel stuck up like a duck with its head in the water.'"